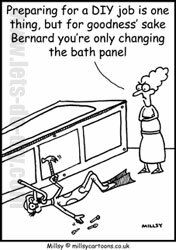 For any DIY tiler the last thing you want to worry about is breaking tiles when trying to cut them. Cutting tiles can be a challenge, it is essential to have a good tile cutter, or the wastage of broken tiles can prove to be expensive. 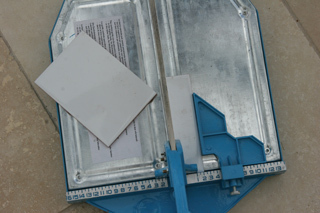 Today I will be putting the Silverline Expert Tile Cutter to the test. The Silverline Expert Tile Cutter looks the part; it is well constructed from die cast aluminium - not the sort of tool that is going to break if you accidently stepped on it. The solid steel guide bar is robust and the handle fits comfortably in the hand. 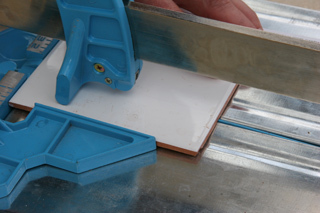 The sprung base plates allow for give under the tile so that it breaks cleanly each time. It is amazing how such a simple design can work so effectively. 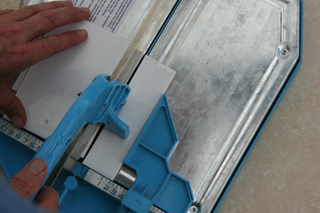 The Silverline Expert Tile Cutter uses a simple ‘score and snap’ mechanism whereby the tile is placed in position on the base of the tile cutter, lining up the line to cut with the steal guide bar. Pushing the handle away across the tile a line is scored. Then with the smallest amount of force push down on the handle, cleanly breaking the tile. 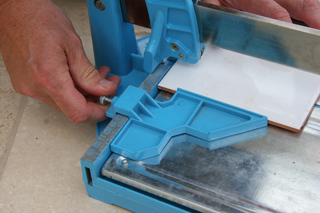 The problem that commonly arises when using a tile cutter is that tiles will not break cleanly causing large amounts of wastage and frustration as you can imagine. 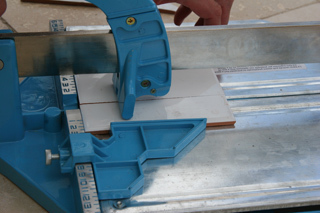 With the Silverline Expert Tile Cutter, this problem is non existent. With a maximum depth cut of 15mm I found the Expert Tile Cutter effortlessly went through the ceramic tiles, taking half the normal time, no tiles were wasted and it gave professional looking results. I was very impressed with the simplicity and precision of this tool. One thing to note is this tile cutter only cuts parallel; it does not cut curved lines (if, for example, you wanted to tile around a pipe). Included is a measuring guide, this allows you to align your tile at right angles or at 45 degrees to get the perfect cut. A basic guide is included; to be honest a manual or guide is not really required here. I rate this tool highly. It is priced at the high-end of the market, but a good example of getting what you pay for. 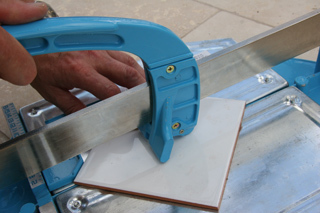 What I love most about the Silverline Expert Tile Cutter is that it’s not a fussy tool, it’s robust, well made and clearly up to the job.